DSC (Database Systems Corp.) has been developing computer technology and software since 1978. More recently DSC undertook the development of computer phone technology. Among the many products provided by DSC are voice broadcasting systems and automated phone answering systems. DSC also provides outsourced calling services utilizing this advanced technology including emergency voice broadcast services. Whether you need to purchase your own emergency phone dialer or utilize our emergency alert service, DSC can deliver your emergency and alert messages promptly and accurately. Upload lists of recipients’ phone numbers to our secure website. Call the toll free number provided to make voice recordings of your out-going messages. There is no limit on the number or length of the phone lists you provide. Contact DSC to learn more about our emergency alert systems and phone message delivery services. The University of Southern Indiana acquired an emergency alert system from Database Systems Corp. to contact students and faculty during an emergency situation. This system can also be used to make special announcements during non-emergency events. The DSC emergency alert phone system is a state-of-the-art message broadcasting system that can send one phone message or can deliver millions of pre-recordered voice messages to a community or region of the country. Warning messages can be played to either individuals and answering machines or just to individuals informing them of emergency alerts or providing severe weather warnings and updates. After our system delivers the recorded message, the call recipient can be given the option to make menu touch phone selections using the phone keypad. This menu can be programmed as a simple menue or a complex script developed using our emergency notification phone software. The call recipient can always have the option to be transferred to an operator or to an outside third party if your emergency centers require the personal handling of a call. An important benefit of today's telecommunication advancement is the ability for your emergency response team to work from home. Database Systems Corp. has developed a family of telecom products that facilitate and promote this capability. Our emergency notification system and computer telephony products fully support remote agents. Now your workforce can be significantly expanded with the addition of work at home employees. The economic savings and environmental advantages are significant. To obtain additional information about our remote agent capability with our emergency phone dialer, contact DSC today. Contact Us Today to learn more about our emergency alert systems and phone services. 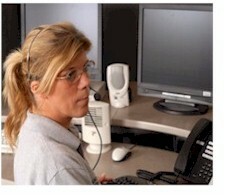 CARE®, Call Reassurance® and Emergency-Calling.com are Trademarked by Database Systems Corp.